LEWCO Custom Line Shaft Driven Live Roller Sortation System - LEWCO Inc.
An office furniture manufacturer recently moved and sorted their products manually, and resulted in products being handled several times. The customer approached a LEWCO distributor for a solution to reduce labor and increase the accuracy of the products accumulating on the shipping dock. After initial discussion we arrived at a line shaft powered sortation conveyor solution with an indexing infeed belt with an overhead mounted sizing sensor for lane determination. This resulted in a flexible solution with economical operating costs. The sensor measures the size of the product and determines which lane to which it is sorted. LEWCO’s Control system includes a Touch Screen interface, allowing the customer to change the destinations based upon product size. The sensor has the ability to be taught new product sizes, too. Using LEWCO LSLR19 line shaft conveyor with slave driven transfers allows all the powered rollers and four transfers to be powered by one motor. The storage lanes are non-powered. Let LEWCO show you how we can solve your product movement dilemma. 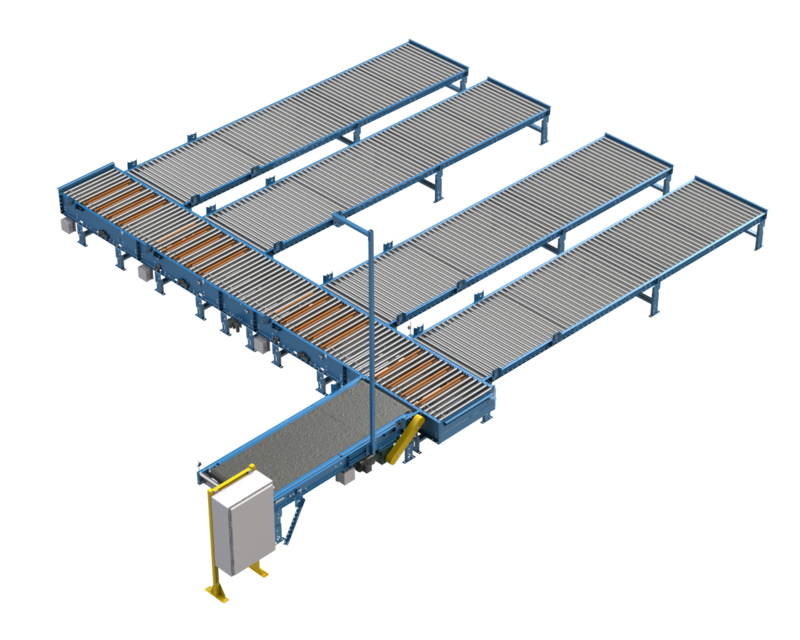 LEWCO has an extensive amount of experience designing and manufacturing Conveyor Equipment. Our highly knowledgeable staff of Application Engineers can help assess your application and recommend cost-effective solutions. You can email your requirements to conveyorsales@lewcoinc.com, call (419) 625-4014 ext.4003, or request a quote on our website.